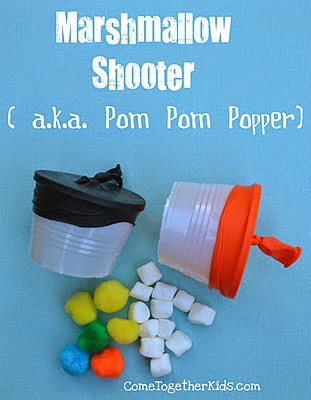 If you are looking for something fun which you could do with your grandchildren on a nice Spring day when they are at your home, check this idea which I found on Pinterest for Marshmallow Shooters!!! Follow this link and you'll find a supply list, complete instructions and a photo tutorial for making your own Marshmallow Shooters . . . be sure to have a camera handy as you are likely to get some great photos as your grandchildren make and play with their Shooters! I loved the idea of drawing targets with sidewalk chalk . . . and marking how far they are able to shoot their marshmallows! So, have you ever tried these with your grandchildren/children?